Pray for the grace of an abiding sorrow for sin. AN ABIDING SORROW FOR SIN: WHY IS IT SO CRUCIAL? There is a fascinating scene in Milton’s Paradise Lost where the fallen angels, having been cast down into hell after losing their battle to overthrow God, have a rap session about what went wrong, and come to the conclusion that they just didn’t realize how powerful God is. It was, sad to say, the wrong time to learn that lesson. In a similar vein, the right time to discover God’s vehement dislike for sin – sin being completely contrary to God’s Infinite Sanctity – is not at the final judgment! We are called to be a repentant people, and the “fruition of [this] repentance” is true sorrow for sin. And yet we so often find ourselves committing the same sin today that we confessed last week, which raises the question whether we have nurtured a true sorrow – indeed, even contempt – for that sin (or whether, in actuality, we still harbor a secret affection for that sin which we need to wage war on?). The “moral imperative” of the Gospel to be holy (as one theology professor taught me) goes to the very essence of what the Gospel is all about. Father Faber has a chapter called “Abiding Sorrow for Sin” in his excellent book, Growth In Holiness. I skipped the chapter initially because it didn’t catch my interest, but when I finally read it I was deeply moved by it. Faber states that he spent much time reflecting on what hinders devout persons from moving on to greater perfection in the spiritual life, and he came to the conclusion that it is the failure to enkindle in one’s heart an abiding sorrow for sin – not one’s particular past sins already forgiven, but a sorrow in general for our past sins and all the sin in the world that opposes our great God. It is this abiding sorrow for sin that maintains a true humility in our souls and makes us genuinely thankful – indeed overwhelmingly thankful – for what Jesus did for us. This sorrow also makes us genuinely eager to spread the good news of salvation, thus making us productive workers for Jesus’ interests.This attitude of sorrow and thankfulness makes us fall more deeply in love with Jesus. If you have the book All for Jesus, take a look at Chapter Three, “Be Sorry for Sin” (“Love Wounded by Sin” in the unabridged TAN version), and you will find a powerful explanation of this concept of nurturing an abiding sorrow for sin (and you will be thankful for it). Faber spent an enormous amount of time studying how the saints grew in holiness, and this nurturing an abiding sorrow for sin is a fruition of his efforts (much to our benefit). This sorrow for sin corresponds to our love for God. We are sorry for all the sin in the world precisely because sin robs God of the glory he intended for creatures. We therefore begin to see sin from the perspective of God’s Infinite Goodness, and for this reason we begin to sorrow over all the harm sin causes in the world. We therefore begin to dislike sin because it is so contrary to God’s plan for our lives and so harmful to Him who is “deserving of all our love.” Pray for the grace of an abiding sorrow for sin. This abiding sorrow for sin will help to console the Sacred Heart of Jesus. 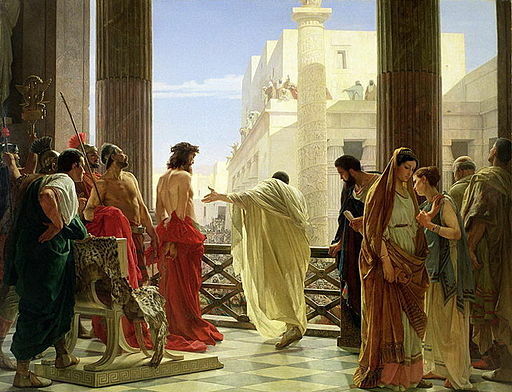 Image: Ecce homo by Antonio Ciseri (between circa 1860 and circa 1880). Public Domain, U.S.A.